Historically, Google leveraged its advantageous ad serving position as leverage for its own exchange, the DoubleClick Ad Exchange, or "AdX." But when publishers, advertisers and independent exchanges began cultivating header bidding, Google saw the writing on the wall. It also saw an opportunity to test the development of a new kind of market transparency, in which exchanges bid simultaneously to create the highest yield possible for publishers. Google says Exchange Bidding will remain a test for the foreseeable future -- but Sam Cox, group product manager at DoubleClick, who is leading the initiative, implies it is likely to be released for “general availability” in the near future. Cox says it is part of Google’s overall push to improve consumers' browsing experience, including things like Google Chrome’s move to block ads on sites that do not comply with the Coalition for Better Ads' Better Ads Standards. 3 comments about "Google Discloses Results Of 'Exchange Bidding,' Boosts Publisher Yield >40%". John Grono from GAP Research, February 19, 2018 at 6:40 p.m.
Gosh. The previous biddig system must have been grossly inefficient or ineffective for this single change to provide +0% yield. And to think that the general impression was that it was the best thing since sliced bread. John Grono from GAP Research replied, February 19, 2018 at 6:48 p.m.
Oops. Of course that should be +40%. It's either fat fingers or sticky keyboard. Joe Mandese from MediaPost, February 19, 2018 at 7:26 p.m.
@John Grono: Well, it's not a "bidding system" so much as a marketplace. 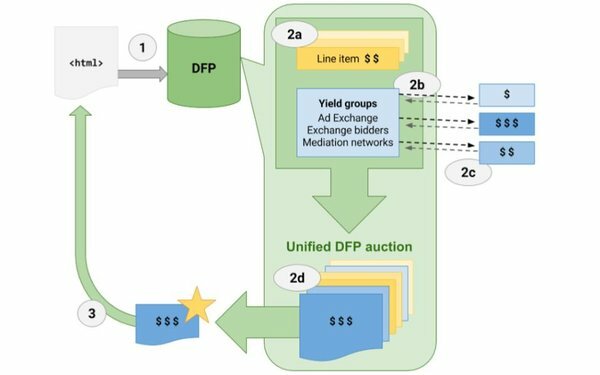 The marketplace was originally set up to favor the buy-side, including the second price auction, but it was made further inefficient by a waterfall of middleware players that we got to the point where pennies on the programmatic ad dollar went to the publisher. So anything creating more leverage for the supply-side would create lots of upside. What Google and the exchanges are doing is optimizing bids on the supply-side before the bids clear.